(L)Raquel Kops-Jones and (R)Abigail Spears win doubles at 2014 Aegon Championships. BIRMINGHAM, England - Raquel Kops-Jones and Abigail Spears were pushed for the third straight match in the final of the Aegon Classic on Sunday but were resilient once again in beating defending champions Ashleigh Barty and Casey Dellacqua and securing their first WTA title of the season. No.3 seeds Kops-Jones and Spears were extended to match tie-breaks in their quarterfinal win over the Chan sisters and in their semifinal win over No.1 seeds Cara Black and Sania Mirza, in the latter case being two points from defeat in the match tie-break. Second-seeded Barty and Dellacqua, whose first WTA title as a pairing came here last year, came into this encounter 12-1 on grass. The finalists had split their two previous clashes, with Kops-Jones and Spears losing the most recent one at Wimbledon last year. This time, Kops-Jones and Spears had to overcome three set points down 6-5 on Kops-Jones' serve but then cruised through the tie-break and the second set for a 7-6(1), 6-1 triumph. The key stat was break point opportunities, with the Americans converting on three of five compared to just one of six for their opponents. "We were working on a lot of things this week," Spears said. "It was good to come out on top. They're a good team. It was good to get a chance to play them the first week on grass. "We never give up. We have played together for a long time. We'll have some bad matches, maybe some bad days but we're always wanting to get better. Our friendship as well is a huge thing. We're pretty much best friends. I think that really helps us to be able to talk through things." Kops-Jones and Spears improved to 9-6 in WTA finals, with this being their fifth Premier-level title - the previous ones coming at Carlsbad and Tokyo in 2012 and at Stanford and Carlsbad in 2013. The duo also ensured they will rise a spot to fifth on the Road To Singapore leaderboard, helping their chances of qualifying for the season finale for the first time. 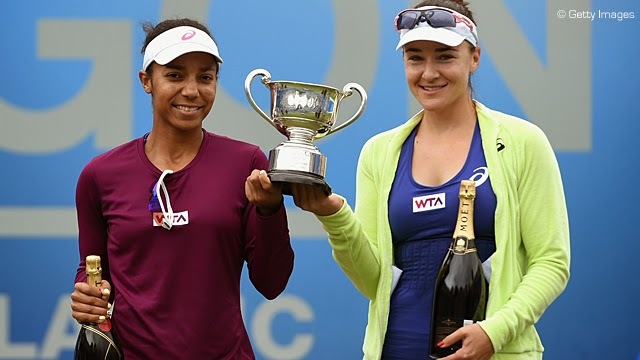 Birmingham was Kops-Jones's 11th WTA doubles titles and Spears' 13th.